PANS (Pediatric Acute-onset Neuropsychiatric Syndrome) is when an infectious trigger, environmental factors, and other possible triggers create a misdirected immune response results in inflammation on a child’s brain. In turn, the child quickly begins to exhibit life changing symptoms such as OCD, severe restrictive eating, anxiety, tics, personality changes, decline in math and handwriting abilities, sensory sensitivities, and more. PANS was introduced in 2012 by Dr. Susan Swedo in the paper From Research Subgroup to Clinical Syndrome: Modifying the PANDAS Criteria to Describe PANS (Pediatric Acute-onset Neuropsychiatric Syndrome). In October 2014, an online copy of a Consensus Statement on PANS diagnostic guidelines was published by the Journal of Child and Adolescent Psychopharmacology. These guidelines were agreed upon by “a geographically diverse group of clinicians and researchers from complementary fields of pediatrics”. The paper is entitled Clinical Evaluation of Youth with Pediatric Acute Onset Neuropsychiatric Syndrome (PANS): Recommendations from the 2013 PANS Consensus Conference. This is the first of many papers that will be published. A hard copy, published version will accompany a series of papers in January or February 2015. 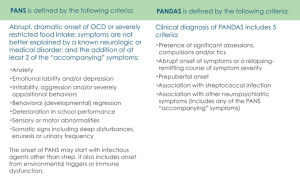 PANDAS is when specifically strep is connected to the sudden onset of OCD and/or tics along with other listed clinical symptoms. PANS removes the emphasis of the etiologic factor and concentrates on the clinical symptoms. PANS can be triggered by any infectious agent (NOT only strep) in addition to non-infectious triggers which are yet to fully determined, but may include metabolic disorders and environmental factors. Symptoms cannot be explained by any other neurological or medical disorder. 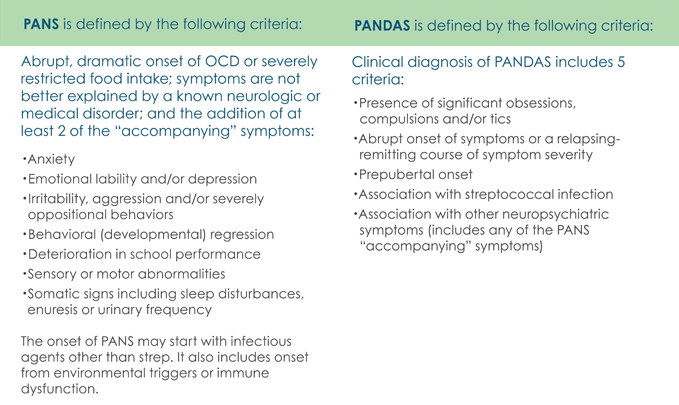 PANDAS and PANS have slightly different diagnosing criteria as seen by the chart below. Abrupt, dramatic onset of obsessive-compulsive disorder or severely restricted food intake. When strep does not appear to be the initial trigger, one should looks into PANS as it encompasses a wide variety of possible triggers. Some suggested tests appear on the testing of this website. No concrete treatment plan for this syndrome has been offered at this time by the NIMH, but treatment plans similar to PANDAS should be attempted. If the onset of symptoms are corresponding to an infection, PANS children may have moderate to dramatic improvement with the appropriate antibiotics within one week of treatment, however, further interventions may be needed. Many parents and doctors report prolonged antibiotics (two months to one year) and/or IVIG (intravenous immunoglobulin) treatment or plasmapheresis may be beneficial. PANDAS is still recognized by the NIH, practitioners, and researchers as a legitimate disorder. PANS broadened the criteria and includes the subset of PANDAS. As seen by the hierarchy chart to the right, PANDAS is now considered a subset of PANS. PANDAS and PANS are likely related, but doctors are working to find ROOT causes. PANS did not replace PANDAS. PANS is not be confused with a PANDAS child that begins to react to non-strep triggers. As noted in Dr. Swedo’s landmark paper on PANDAS, even though strep is the initial trigger in PANDAS, subsequent exacerbations can still occur as the result of other assaults on the immune system. It states, “…Primary responses are specific (e.g., directed against a particular epitope on the GABHS), while secondary responses are more generalized. Thus, the lack of evidence for a preceding strep infection in a particular episode does not preclude the diagnosis of PANDAS…however,that the diagnosis cannot be made without establishing a clear association between GABHS infection and symptom exacerbation…”.